Via Seattle Met, a group that puts together food truck rodeos is currently looking for vendors to join them in a new “pod” at the Fremont Sunday Market. Up to ten of them will park there from 11 to 4 starting February 19. For now it’s a monthly thing but “will become weekly as the weather improves,” according to event manager Danniel Linn. The group is also looking to do more pod pop-ups at other Fremont locations and events, such as the Fremont Outdoor Movies. The Sunday market currently has a good selection of food carts but is a little light on the food trucks, with Maximus-Minimus usually being the only one. Looks like it’s about to get a lot more crowded. And tasty. So I took some liberties with Shakespeare there. Still, I accomplished what I needed to, which is to introduce the Rogue & Peasant (3601 Fremont Ave. N, #207), which has been described as a coffee shop/music club opening in the space next door to the new Hunger location. The new spot, described as “a place where all genres of people and music can be expressed,” opens its doors on January 27th. According to their website, it will be open every day of the week, from 6am to 2am Monday through Saturday and 8am to 2am on Sundays. Owners Jeremiah David Johnson, Amber Schein and Loren Schein has been hush-hush about details so you’ll just have to show up opening night to find out the specifics. The band Sweet Secrets has a gig booked there on February 3rd. I always enjoy walking to the top of the walking bridge over Aurora Ave. on 41st St. and stopping right at the top of the Fremont-side stairs. You get a great little view of Seattle that includes Lake Union, downtown and the Queen Anne hill. I imagine, however, it can be a bit of a pain for bicyclists to carry their bike up and down the bridge all the time. And apparently SDOT thought the same thing. They’ve installed a runnel along the length of the bridge. Basically, a runnel is a track on a staircase that allows you to roll your bicycle with you as you walk up and down. It’s like a little ledge for your wheels to make life just a little easier. 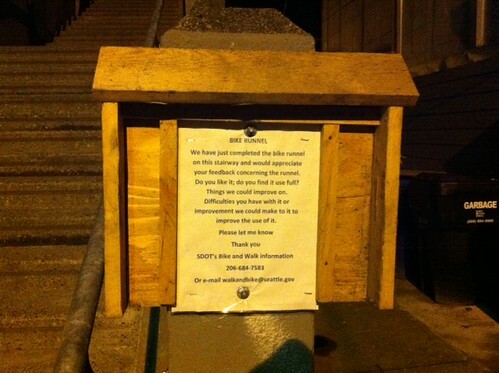 The runnel is installed and now SDOT would like to know how it’s working for everyone. 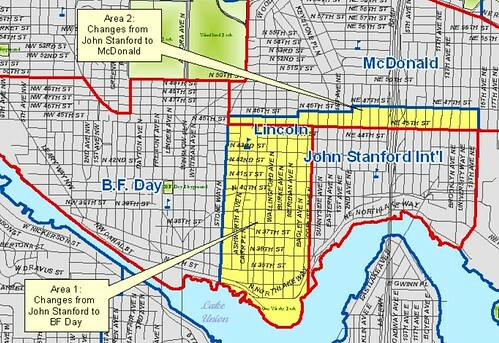 They’re asking for feedback and suggestions to be sent either by phone (206) 684-7583 or email (walkandbike@seattle.gov). Seattle food and yard waste, garbage and recycling collections will be on its normal schedule for Martin Luther King, Jr. Day, Monday, January 16th. Seattle Public Utilities customers should place their containers out for collection by 7 a.m. to ensure collection as usual. The City of Seattle’s North Recycling and Disposal Station in the Fremont/Wallingford area and the South Recycling and Disposal Station in the South Park area will be open during their regular business hours: 8 a.m. to 5:30 p.m.
Customers can report a missed garbage, recycling or food and yard waste collection by calling (206) 684-3000 during regular business hours on Tuesday, 7:30 a.m. to 5 p.m., or by visiting the Online Missed Collection form at: www.seattle.gov/util/Services/Garbage. I’ll bet when you think of book clubs, you imagine a group of middle aged Seattle women sitting around sipping tea, munching crackers and chit-chatting. You might be wrong – at least, about one group. The Bushwick Book Club Seattle does things a bit differently, and their monthly meeting brought the community together in a big way last Friday (Jan. 6) at the Fremont Abbey Arts Center. Lewis Carroll’s Alice in Wonderland was the inspiration for 11 book club member/musicians’ sets performed throughout the evening to a packed house. The Fremont Abbey offered a unique and casual setting in the upstairs of the venue complete with high ceilings and fold-out chairs. Many attendees took advantage of the elaborate baked good table and beverages offered downstairs. After drawing names for the order of their appearance, musicians entered stage to describe the meaning or inspiration behind the original song they were to perform. Some performers took the various characters from Alice in Wonderland as inspiration, while others sang about their overall impression of the novel, and a few simply made up characters. Hey, it’s Wonderland, why not? Acoustic guitars were the main accompaniment for most songs, but other instruments like the harmonica, bass, violin, drums and accordion made an appearance. There were roughly 175 people in attendance and the performances hailed an intimate yet casual feel. Songs ranged in their genre throughout the evening from bluegrass to alternative. Hunger On The Move, Headed Down Fremont Ave. The bad news? Hunger Restaurant will be leaving the space in Upper Fremont that it’s been since July 2010. The good news? Hunger is moving right down Fremont Ave. to take over the space formerly occupied by Dad Watson’s (3601 Fremont Ave N). 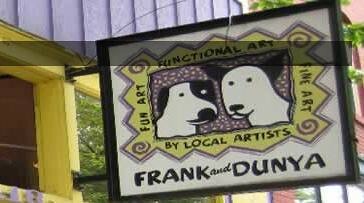 Co-owner Brian Brooks says that while he and co-owner/wife Jaime Mullins-Brooks originally wanted to expand their current space, the new location was too good to pass up when it became available. Brooks is hopeful for the new space to be open in late February/early March as builders have gutted and reworked the entire building since Dad Watson’s left. Fear not, Hunger’s regulars, you’ll still get the same Spanish/Mediterranean-influenced cuisine. You’ll just get a whole lot more of it. As they get closer to the new opening, Hunger expects to hold events in both locations, as a thank you to their loyal customers in the current spot and as a welcome to the neighborhood in their new location. 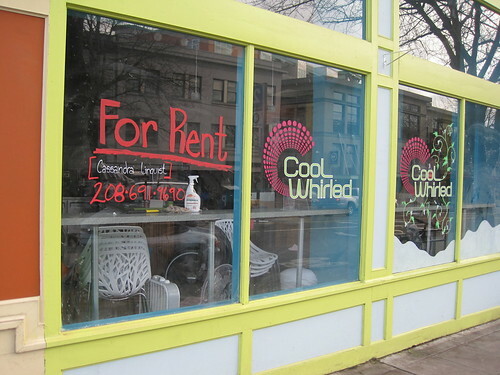 Cool Whirled (3420 Fremont Ave. N) opened its doors in early August but the frozen yogurt shop wasn’t able to make it through January as they’ve closed their doors and put the storefront up for rent. After three years of wanting to open the store and the planning that goes into it, owners Cassandra Lindquist and Mark Hausman opened the self-serve frozen yogurt spot as a change of pace for Fremonsters used to the baked treats available around almost every corner. The Facebook and Twitter accounts stopped making updates in mid-November and the winter months likely stalled store traffic as the doors officially closed with the new year. The space is currently available for rent with an asking price of $4,500/month.